Jan. 13, 2015, 11:11 a.m.
Its new website and newsletter Charlotte Five is an attempt to use lessons from viral publishers to find a spot in young people’s daily habits. By Joseph Lichterman @ylichterman Jan. 13, 2015, 11:11 a.m.
Every weekday at 7 a.m., the countdown clock atop the Charlotte Five homepage resets — counting the hours, minutes, and seconds until another batch of five stories are posted. The site is an effort by the Observer to reach a younger audience. Like those of most major metropolitan newspapers, its core readership is aging while Charlotte’s millennial population grows — and national outfits like BuzzFeed have won young residents’ attention in ways the local daily might have before the web. “One of our goals for 2015 is to reach the young demo here in the Charlotte area. And that demo has local news as a light interest, so they care a little bit about it,” said Ted Williams, the Observer’s director of digital strategy and new initiatives and the lead on Charlotte Five. The median age of an Observer reader (print and online combined) is 46; between 2009 and 2012, Charlotte’s millennial population growth was the 10th highest in the United States, according to a 2013 Brookings Institution study. In addition to aggregated coverage of local news and entertainment, Charlotte Five also focuses on what Williams calls “Seinfeld Journalism,” original content that is “stuff people talk about but isn’t really news” — like a ranking of the eight worst parking lots in the city or a post Williams wrote describing how he had to take the SAT because he finished last in his fantasy football league. Charlotte Five’s website is responsive, but site was designed to be mobile first — the desktop version is essentially just an enlarged version of the mobile site, with the photos stretching out horizontally. The stories are also optimized for phone consumption, with lots of lists, bullet points, and chunks. For example, when last week a group of Charlotte private and civic organizations pledged $11 million to eradicate chronic homelessness in Mecklenburg County, where Charlotte’s located, by 2016, the Observer covered the announcement with a 1,200-word news story and an editorial supporting the plan on the opinion page. Charlotte Five, meanwhile, published “8 sobering stats about Charlotte’s homeless problem,” linking back to the original Observer news story while also embedding tweets and including additional facts. That’s the sort of voice Charlotte Five wants in its stories. Jen Rothacker, the Observer’s innovation editor, who also works on Charlotte Five, described it as a “breezy and easy” read that doesn’t take long to consume and is meant to be shared. They also highlight the finite nature of the product, arguing that if you read the five stories in Charlotte Five everyday, you’ll know what’s important and what’s going on in the city and won’t be overwhelmed by the constant stream of content on Twitter or Facebook. Charlotte Five was conceived at an off-site management retreat last year; it took about 75 days from the time the project was approved to when the site went live around Thanksgiving. Since then the Observer hasn’t marketed the new site; there’s no mention of it at all on the Observer’s main site, and the only mentions of the Observer on Charlotte Five are deeply buried on its about page. As of now, Charlotte Five has been run separately from the Observer newsroom, but Williams said there have been very preliminary discussions on how the two could potentially work together, but he said “we don’t know how these brands go together — or if they even should.” Williams said they’ll look to refine a marketing plan for the site later this year. Still, the paper isn’t taking a huge financial risk with Charlotte Five as the costs are minimal and the site has had advertising support from the start. OrthoCarolina, a large local orthopedics practice, has been the sole advertiser thus far, attaching its brand to the website and email newsletter as the presenting sponsor. OrthoCarolina has a significant marketing presence throughout Charlotte, advertising on everything from local TV and radio to billboards, airport signage, and more digital targets like paid search. But Blair Primis, OrthoCarolina’s director of marketing, said Charlotte Five offered a younger audience that was appealing to the company — even if you might not associate millennials with an orthopedics practice. 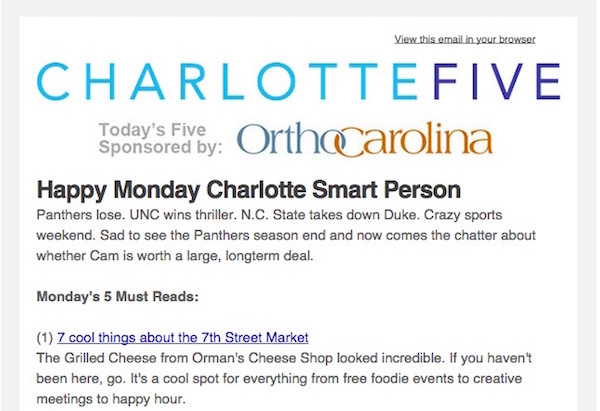 For now, OrthoCarolina’s advertising has been limited to being the presenting sponsor for the site and newsletter, but Charlotte Five would eventually like to add native advertising as well. But aside from the costs associated with actually setting up the site, though, the Observer’s costs are limited to Rothacker increasing the number of hours she works each week (from 30 hours to 40 hours) and a bumped-up freelance budget, she said. Williams and Rothacker are the primary Observer staffers working on the site — “Jen and Ted’s Excellent Adventure,”, she called it — but they still have other responsibilities at the paper and can’t dedicate all their time to running Charlotte Five. They rely on a network of four freelancers to contribute material for the site, though Williams said he’d like to have up to 10 freelancers total writing. Both credit the freedom the Observer has given them to experiment along with the cooperation between the business and editorial teams as part of the reason Charlotte Five has gotten off the ground. Williams and Rothacker are in constant contact about the site. Rothacker will usually work later in the evening, writing up many of the posts that will go into the next day’s Charlotte Five. Williams takes the early shift, sending out the newsletter every day. And once the newsletter hits subscribers’ inboxes at 7 a.m., their work, and the countdown to the next day’s five stories, begins again. POSTED Jan. 13, 2015, 11:11 a.m.
Lichterman, Joseph. "How do you get millennials to care about local news? The Charlotte Observer is testing out one idea." Nieman Journalism Lab. Nieman Foundation for Journalism at Harvard, 13 Jan. 2015. Web. 23 Apr. 2019. Lichterman, Joseph. "How do you get millennials to care about local news? The Charlotte Observer is testing out one idea." Nieman Journalism Lab. Last modified January 13, 2015. Accessed April 23, 2019. https://www.niemanlab.org/2015/01/how-do-you-get-millennials-to-care-about-local-news-the-charlotte-observer-is-testing-out-one-idea/.